The Caspian Sea is a highly productive enclosed body of water threatened by permanent environmental decline (CEP, 2002). developed for dealing with the series of environmental problems the region is faced with today. The Caspian Sea is originally a unique reservoir of relic flora and fauna which are mostly endemic (Dumont, 1998). It has rich food resources for the riparian countries as well as the world markets. Caviar and Sturgeon, as well as Kilka are among the economically important food resources seriously affected by the environmental crisis in the Caspian Sea. Ecological deterioration has started in regions of great economical value such as near the Volga river delta and the adjoining North Caspian Sea (Kosarev and Yablonskaya, 1994). On top of these changes, the recent increase in invasive species, in particular of Mnemiopsis, having been introduced from the Black Sea via the Volga-Don canal, is causing great concern, because of its effect on the biodiversity of the sea and its fisheries yield (CEP, 2002, K�dey� and Moghim, 2002). In addition to these immediate environmental signals, there is a longer term threat, which may lead to rather rapid, precipitous collapse of the ecosystem: the threat of eutrophication in an enclosed sea, as has been recently experienced in the neighboring Black Sea (�zsoy, 2001). Since the later part of the 19th century, oil production has been a major activity in the region, and contamination of the sea by the recent revival of the oil and gas industry could contribute to the mounting environmental problems of the Caspian Sea under these conditions. The increased transport of oil from the Caspian Sea could in fact have far reaching effects in neighboring regions through which oil and gas are transported by ships and pipelines. Environmental threats to the Turkish Straits resulting from the export of Caspian oil through the Black Sea is an immediate problem with a startling international policy dimension (Plant, 1996; 2000). 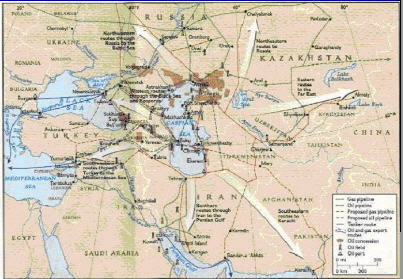 Five independent countries (Azerbaijan, Russia, Kazakhstan, Turkmenistan and Iran) share the coasts of the Caspian Sea. With the exception of Russia, the riparian countries yet are not parties to the Maritime Law Convention, although they often apply the generally accepted norms. Most legal regulations, including those on fishing and protection of biodiversity take place mainly at the national level (CEP, 2002). This also means that the diagnosis of environmental problems lacks the regional dimension that is often needed for developing a common approach to solve them. Five riparian countries in November, 2003 in Teheran have signed a Convention on the Caspian Sea, which is expected to play a positive role for the protection of the Caspian Sea ecosystem. Despite the present lack of agreement between riparian countries on the international legal status of Caspian Sea, the need to establish a regional GOOS (Global Ocean Observing System) providing a system of coordination between riparian states for systematic monitoring of the Sea has been repeatedly expressed in recent years. Similar cooperation in enclosed and semi-enclosed seas elsewhere, supported by IOC/UNESCO, has led to examples such as the BOOS, MedGOOS and Black Sea Goos, respectively for the Baltic, Mediterranean and the Black Sea. It is desirable that in the event of a settlement, the Caspian GOOS could be started with a demand from all riparian states of the Caspian Sea. In this respect, collaborative studies between the countries that enable the continuation of marine research on a regional scale could also set the stage for each country to develop their own research in a regional, cooperative manner based on exchange of expertise and data for a better understanding of the Caspian Sea. If a Caspian Sea GOOS organisation can be established with representation from all riparian states, then more international funding can be secured to develop the researh and conservation efforts further. Concurrently with the increasing environmental problems, expert studies monitoring and diagnosing the health of the Caspian Sea have been hindered by the economical problems in the region. Scientific inquiry into the structure and causes of the environmental problems of this poorly understood and vulnerable system requires pooling and efficient use of resources, building on the individual efforts of the riparian countries, and those of the neighboring regions. Expertise and technology exists in the region, and can only be mobilized by urgently needed research support. The Caspian Sea is an isolated, complex realm influenced by large rivers, sea-ice, topographic/geometric effects, upwelling, heterogeneous precipitation and evaporation, and atmosphere-ocean-land interactions in a region of rapid transitions between the sea, deserts, flat lands, and high mountains. It lies in a region of mid-latitude climatic variability, with the Atlantic Ocean and Euro-Mediterranean region in its upstream, and those of Siberia and Central Asia in its downstream. The surface and ground water runoff that ultimately influence the sea-level are derived from a large catchment area, an order of magnitude larger than the surface area of the sea. Its surface level is below the level of the World Ocean and it unites a large watershed area with such different rivers as the Volga, Ural, Kura, and Terek, as well as several small rivers in Iran. With such a low level, the evaporation is the largest of all internal lakes on Earth. An immediate consequence of climatic variability is the observed abrupt changes in sea-level, with a major influence on the stability of the Caspian Sea and the surrounding lands. Most recently, the sea level has abruptly started to rise by more than 2.6 m in the period 1977-96, following an earlier rapid drop in the 1930�s, and the subsequent gradual lowering in the following 30 years. The rapid sea level rise leads to great socio-economic losses in the region, as it has occurred numerous times in history (Radionov, 1994). On the other hand, it is known the change in sea level has a large anthropogenic component related to water retention schemes (Kosarev and Yablonskaya, 1994). The 1930�s was a period of water deficit in which the sea suffered losses of up to 60 km3/yr. The great climatic anomaly of the Northern hemisphere at the beginning of this century reached its highest extent in the 1930�s. The rate of evaporation increased to 395 km3/yr, and the decreased discharges of the rivers amounted to 269 km3/yr on average during the period 1930-1941. As a result of this water shortage, the level of the Caspian Sea fell sharply by 1.8 m at an average rate of 16 cm/yr. The latest increase in sea level also occurred as a result of a significant change in the climate of the Caspian Sea basin. Beginning in 1978, a change in the general circulation of the atmosphere occurred, the number of cyclones in the Atlantic and Western-Europe increased with a simultaneous increase of their water capacity by 35 and 18 % respectively (Sidorenkov, 1996). As a result of the appearance of these climatic conditions, evaporation from the surface of the sea reached 948 km3/yr with a simultaneous increase in precipitation over the surface of the sea (up to 22.5cm/yr). The development of this state of affairs tipped the balance towards a positive net gain. The last rise of a sea level during the 1978-1995 period flooded about 400 km2 in territories of the Azerbaijan coastal zone and resulted in economic losses of 2 billion USA dollars (Mamedov at al 1998, Mamedov 2001). Attempts to forecast sea level trends have consistently failed in the past, because of the poor understanding of the Caspian Sea water budget. Expected changes in the regional water cycle associated with global change can lead to further dramatic changes in Caspian sea level, of up to 4 m in 50 years, predicted by Arpe and Roeckner (1999). The corresponding loss of surrounding land could affect large areas. On the other hand, sea-level change is only an overall indicator that integrates a series of regional climatic and man-made changes that affect not only the resources of this rich enclosed sea, but also of the surrounding land. Apparently, the Caspian Sea has reacted to the global climate change earlier than other places. Therefore the investigation of the Caspian Sea turns out to be extremely important for climate change analysis and prediction. The less obvious and poorly understood climatic mechanism that affects the Caspian Sea is the observed changes in the ventilation of its deep waters, which in turn determines its biochemical regime (Kosarev and Yablonskaya, 1994, Dumont, 1998). Recent hydrological data analyses show dramatic changes of vertical stratification of the thermohaline fields in period of pre- and post sea level minimum period in 1977 (Kosarev and Toujilkine, 2002). 4.2. Identification of the problem to be addressed by the Project The need to understand the fragile Caspian Sea, issuing clear signals of anthropogenic stress and climate change, provides the motivation for this project. Remedies to present problems of the Caspian Sea cannot be established without proper scientific understanding of the structure and functioning of the Caspian Sea ecosystem. A sufficient amount of historical data and expertise exists in the region for making an analysis of the present state of the Caspian Sea marine environment, its past states and to build tools for predicting its future based on modern observation methods and modelling. The main goals of the project are: to improve the regional capacity for analyzing the functioning of the Caspian Sea, and to understand its present state for predicting future changes with respect to natural and anthropogenic influences, based on pooling of data and scientific expertise on a regional basis. The project, with participation of research groups from the region, will make a new synthesis of the already available knowledge, based on various national and international sources of data, make an experimental investigation of the anticipated circulation, ventilation and transport processes to understand their roles in sustaining the ecosystem, describe the past and present productivity and biodiversity patterns, and use the information to make numerical model simulations of the processes involved. The scientific analysis on one hand will help develop a better understanding of the individual physical / biochemical processes, and on the other hand will serve to form an independent opinion on the functioning of the ecosystem and the environmental state of the Caspian Sea. The project methodology is expected to lead to the establishment of basic tools required for environmental management and decision-making in the region, at the same time providing the seed to help develop cooperation, and bridge the gaps of knowledge between riparian countries through the efforts of an experienced consortium of scientists and institutions. A significant level of expertise will be transferred from the neighboring Black Sea and Eastern Mediterranean regions by scientists who have had recent experience there often with similar and at times contrasting environments. The outcomes of the proposed project, based on data evaluation, in-situ and remote observations and numerical modelling, can be used by governmental agencies or private enterprises for planning of economical activities such as fisheries, tourism, shipping, oil and gas industries, and mitigation of pollution in the marine environment. The strategy for the project aims for a description of the present and past physical and biochemical states of the Caspian Sea, based on the analysis of data from historical archives and from new in-situ observations collected and transmitted via satellite, as well as the results from ocean circulation and ecosystem models developed for the Caspian Sea. The collection and analysis of marine and atmospheric observations, and their use in models, either for validation or for data assimilation, is expected to fill information gaps, and thereby reduce uncertainties in environmental changes of the Caspian Sea region. The Caspian Sea has a unique advantage in this undertaking, because its enclosed geometry allows 'closure' usually not possible in other parts of the world - i.e., consistency checks based on a balance between budget components in this controlled laboratory basin. The project sets out with aims for the detection of environmental change, through analyses of physical, chemical, biotic data and updated inventories of pollution, to describe the variability of the hydrography, circulation, biological and fisheries production, including the effects of invasive species on the productivity and biodiversity of the system. The acquisition of new Lagrangian drifters and limited XBT data are expected to provide an improved and detailed understanding of the basin-scale as well as meso-scale circulation and hydrographic variability, which have not been explored earlier. The other contribution of these methods of data collection is in providing modern alternatives for ship-based observations, which have been increasingly difficult to perform in recent years because of economic limitations of the riparian countries. The use of hydrodynamic circulation models driven by realistic hydro-meteorological forcing, satellite altimetric data assimilation, the use of satellite, drifter, hydrographic data and coastal sea-level observations for model validation, and for evaluation of the mesoscale variability and exchange processes, are modern tools that are certain to contribute to the establishment of a scientific basis in Caspian Sea investigations. Results from lower trophic web ecosystem models and a critical analysis of the past and present foodweb structure are additional positive contributions to this scientific basis, and are also urgentlly needed to begin to adress relevant scientific questions affecting the fate of the Caspian Sea. Finally as a result of the project the transfer of technology and expertise will be achieved through consultation with end-users, sharing of knowledge with universities in the region, training activities and workshops. These activities are expected to foster solid scientific collaboration across the region, and will also help transfer the know-how and experience from neighboring regions, where similar situations are experienced. Various theoretical and experimental research projects have been carried out during 1980s and 90s by the riparian countries and by international organizations to address the environmental and socio-economic issues faced by the Caspian Sea. � Knowledge existing in the groups, which will work on the Project Hydrological data processing and analysis have been carried out in SIO, KaspNIRKH and IG for the last 30 years. Monitoring of surface topography of the Black Sea is being carried out by the MHI and will be adapted to Caspian Sea using T/P and ERS altimetry (the research is supported by the NANU and NSA). IG makes regular hydrological and meteorological measurements �n the Azerbaijan sector of the Caspian Sea. Projects, which either finished recently, or in continuation, in the Partner Countries are listed in Curricula Vitae of Co-Directors (see Appendix 3). Several national projects aimed at the development of diagnostic and prognostic eddy-resolving general circulation and sea-level dynamics models of the Caspian Sea have been carried out in INM in the last 10 years. Theoretical and experimental studies of air-sea exchange processes of the deep-sea and shallow parts of Caspian Sea are carried out in IWP. Using the 3-dimensional Model of Enclosed Sea Hydrodynamics (MESH), developed in the INM (Ibrayev, 2001), Ibrayev et al. (2001) have diagnostically studied seasonal variability of the Caspian Sea climatological circulation based on mean multi-year hydrological data. These studies show that the main factors defining sea currents are drift currents, interaction of drift currents with bottom topography, horizontal and vertical transport of water masses, and local heat fluxes through the sea surface. They also emphasized the crucial role played by the spatial pattern of seasonal forcing, as well as the contribution by meso-scale processes. An analysis of climatological temperature, salinity and oxygen data has been carried out at MSU, based on comprehensive hydrological data base of the Caspian Sea (Kosarev, Tuzhilkin, 1995; Mamedov, 1996, 2000). The analysis of the literature sources and observations indicate that permanent currents are difficult to demonstrate in the Caspian Sea. The existing schemes of mean currents could in fact be quite fictitious or at best speculative in the long-term. The main time scales of variability of the Caspian Sea circulation are in the meso- to synoptic scales, with periods from several hours to several days (Mamedov, 2000). Investigations contributed by the IWP in the last 20 years have shown that up to 90% of the Caspian Sea level changes could be explained by corresponding changes in the water balance components (Golitsyn and Panin, 1989), though the shallow water influence on the evaporation was not taken into account. Evaporation from the Caspian Sea has been investigated by Panin (1987), based on the theory of estimation of air-sea interactions. Detailed experiments carried out by the IWP on the shallow waters of the North Caspian have shown increased energy and mass exchanges compared with the deep sea, directly connected with the increased aerodynamic roughness in shallow water. Since 2002 SIO is heading the Russian Ministry of Industry, Science and Technologies Project �Estimation of Variation of Base Thermohydrodynamic Parameters of the Caspian Sea and its Impact on the Evolution of the Sea Ecological State�. The general goals of the ongoing Project are: (i) to monitor main hydrographic, dynamic and meteo parameters of the Caspian Sea; (ii) to analyze seasonal and interannual variability of main thermohydrodynamic parameters; (iii) to meet the requirements of the Caspian Sea ecological state forecast in hydrophysical and meteo data. Since the early 1990s regular measurements of the Caspian Sea level and main thermohydrodynamic parameters are practically absent. To fill this gap, SIO organized a permanent monitoring of the Caspian sea surface temperature, sea level, chlorophyll concentration, mesoscale dynamics, wind and waves, and some of the meteo parameters on the base of satellite IR and VIS data (AVHRR NOAA, SeaWiFS, MODIS), altimetry data (TOPEX/Poseidon, Jason-1) and re-analysis data (Kostianoy and Lobkovskiy, 2003; Kosarev et al., 2003; Litovchenko et al., 2004). Processed IR and VIS satellite imagery of the Caspian Sea for 2002-2003 and monthly reanalysis data (maps) on SST, chlorophyll concentration, atmospheric pressure, wind, precipitation, humidity for 1997-2003 have been archived. SIO performed an analysis of seasonal and interannual SST variability of the Northern, Middle, Southern Caspian Sea and Kara Bogaz Gol Bay in 1982-2000 on the base of nighttime weekly Multi-Channel Sea Surface Temperature (MCSST) data set based on NOAA AVHRR radiometer measurements (spatial and temperature resolution of about 1/6� x 1/6� and 0.1�C). Interannual positive trends up to 0.3oC/year have been revealed. Relationship of the SST trends with ENSO and NAO has been investigated. TOPEX/POSEIDON altimetry has been used to investigate seasonal and interannual variability of the Caspian Sea level at different locations in 1993-2003 (Lebedev, Kostianoy, 2004). In 1999-2003 SIO and MHI performed yearly drifter experiments in the Black Sea that gave new interesting data on the general and mesoscale circulation (Afanasyev et al., 2002; Zatsepin et al., 2002; 2003). This experience will be transferred to the Caspian Sea where the first drifter experiment will be performed. Caspian Sea Operational Centre of the International Ocean Institute (IOI) is one of the 16 operational centers of the International Ocean Institute, established and supported by the United Nations Deevlopment Program (UNDP). IOI-Caspian Sea is based at the Astrakhan State Technical University (ASTU), Astrakhan, Russia. The mission of IOI is to promote education, training and research to enhance the peaceful and sustainable use of ocean and coastal spaces and their resources, their management and regulation as well as the protection and conservation of the marine environment, guided by the principle of the Common Heritage of Mankind. The Caspian Fisheries Research Institute KaspNIRKH has been carrying out integrated fisheries investigations of the Caspian Sea together with freshwater and river delta ecosystems such as the Volga. Research has aimed environmental protection, preservation of the biodiversity and rational use of the natural and food resources of these water bodies. The development of fishing technology, commercial fishing, aquaculture methods, new equipment for fish protection, methods of fish breeding and juveniles rearing, aiming efficient use of energy and water, and the increase of the product quality has been the main activities of the Institute. For more than 30 years the Institute has been collecting extensive data for the assessment of the present state and possible changes in the hydrological and hydrochemical regime of the Caspian Sea and in the food supply to the basin. At MHI, the procedure for assimilation of the climatic arrays of temperature and salinity for reconstruction of the climatic annual cycle of the basin circulation has been developed as an intermediate step. As it was shown for the Black Sea, dynamical topography of the surface can be estimated with high accuracy (Korotaev et al.,1998, 1999, 2001). MHI has developed a technology for the study of meso-scale sea variability based on analysis of continuous set of IR and visible band images of the basin surface from NOAA satellites and SeaWiFS observations. MHI group has also successful experience of development of the Data Base Management System in the frame of NATO Science for Stability project �TU Black Sea�. 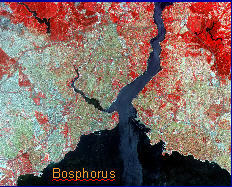 The system is being improved now in the frame of NATO Science for Peace project �ODBMS Black Sea� and contains an interdisciplinary data archive covering the Black Sea basin. The IMS (http://www.ims.metu.edu.tr) conducts oceanographic research in the surrounding Black, Marmara, and Mediterranean Seas, as well as the Caspian Sea, covering a wide range of topics including field investigations and numerical modelling of basin and coastal circulation and ecosystem dynamics, air-sea interactions, dynamics of straits, atmospheric transport of desert dust, marine pollution and biogeochemical transformations. The climatic variability and sensitivity of Levantine, Black and Caspian Seas have been jointly investigated in IMS to show the impacts on environment (�zsoy, 1999, 2001). Ongoing research activities in the Black Sea, including a number of completed NATO projects, have resulted in a fairly well established scientific basis for understanding its basic processes and variability (�zsoy et al., 1997, 1998). The IMS presently carries out a shelf circulation model doubly nested in the general circulation model of the entire Mediterranean Sea and a regional model of the Eastern Mediterranenan in the MFSTEP project (http://www.bo.ingv.it/mfstep), using modern observation systems technology on a Mediterranean basin-wide system. XBT and drifter observations are used in this project along with numerous other systems for in-situ and satellite observations, with a contribution towards near-real-time data transmission. 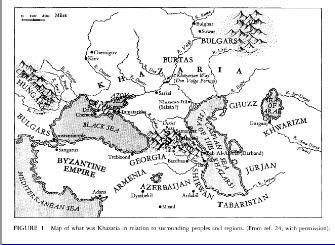 The IMS has for many years been active in the Black Sea studies. Be�iktepe et al. (2001) have used the HOPS (Harvard Ocean Prediction System) model to study the meso-scale circulation of the southern Black Sea and have used in-situ observations including biochemical parameters for data assimilation in the HOPS model. Atmospheric models are also being run in the IMS-METU for the Eurasian Region. An atmospheric model (Nickovic et al., 2001, �zsoy et al., 2001), with elaborated physics for suspension, transport and deposition of dust aerosols has been applied for daily forecasts (http://www.ims.metu.edu.tr/models/med). OPEL, RSMAS conducts numerical simulations (using POM) of marginal and semi-enclosed seas for realistic domains and forcing, including the Intra-Americas Sea (the combined Caribbean Sea, Gulf of Mexico, and Straits of Florida), Japan (East) Sea, and Prince William Sound, Alaska. Mesoscale resolution, synoptic forcing, model output versus observational data comparisons, and nowcast/forecast system implementations and operations, are emphasized. FSU conducts drifter and mooring observations of currents in the Mexican Gulf and on the eastern coast of USA. Mesoscale dynamics, model output versus observational data comparisons are emphasized. Independent funding is to be sought by Prof. G. Weatherly (US) and by Prof. C. Mooers (US) to acquire additional drifters (or subsurface ARGOS-type floats depending on the results of the year 1 drifter study, see Tasks) and/or to set current meter moorings placed so as to monitor currents along the western side of the Middle and/or South Caspian.